Exploring is hard work! Bring some heavy lifting power to break up the boulder and discover what's inside. Drive the Volcano Crawler over the rough terrain and use the ATV to move the rocks into position. Use the jackhammer to crack open the boulder and find the hidden crystal element. Discovering cool things makes the hard work fun! This comes down to 12.34 cent per brick. 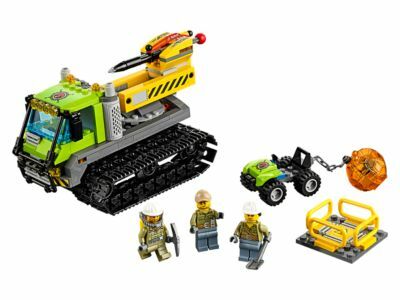 The Volcano Crawler (60122) Lego set is no longer directly available from the sites below. However, 3rd party partners of these sites might still have the set available. Alternate description Drive the big Volcano Crawler to the volcano site to crack open the toughest boulders and make big discoveries. Includes an ATV, boulder and 3 minifigures.